The Dogon people have their villages along the cliffs of the Bandiagara. They came to this region during the 14th century, on the run for the Muslim conquerors. Till today more than halve of the Dogon people are still animist. Only a few villages have a mosque. The cliff on which the villages are located on different heights, goes from Douentza in the north to Bankass in the south. The clay-houses have flat roofs, and the barns are round with a thatch roof. For funeral rituals, beautiful masks and mask dances have been developed. Dancing with the masks is saying goodbye to the deceased on his way to the new world. The Dogon-people brew their own beer from the millet of their fields and drink lots of it on these occasions. 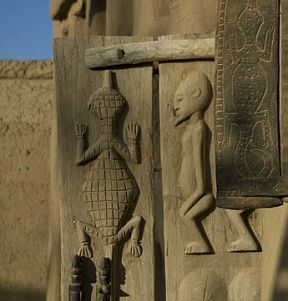 During your trekking through the Dogon country your guide will tell you lots of stories about traditions, legends, popular wisdom and rituals. Even if nobody died, the Dogon people will dance with their famous masks in exchange for some money. The best way is by foot. You just walk from village to village. Together with your guide, depending on your condition and the number of days you want to spend, you define your route (link to map). You can hire people and pack mule's to carry your luggage. If you really don't want to walk, you can make use of the 4x4. You will sleep on the roofs or in the campements. Don't expect a lot of comfort during you stay in Dogon-country. Do expect a breathtaking beautiful world with ancient wisdom. Click here for a visual impression.